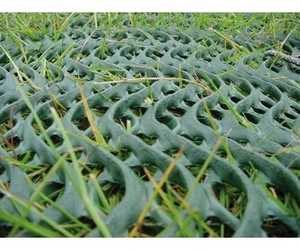 Grass Protection Mesh is a British manufactured extruded plastic mesh that reinforces grass and limiting grass wear, rutting and muddy areas caused by cars and excessive traffic use. The thick Terram GrassProtecta plastic mesh is laid directly onto the existing grass surface. The plastic reinforcement mesh is pinned to the ground using steel U-Pins. Within just a few weeks during the spring to autumn months, the mesh will have completely disappeared as the grass grows through the mesh structure. TERRAM GrassProtecta Grass Reinforcement Mesh is supplied in three thickness of plastic mesh - 14.5mm for heavier-weight applications including overflow grass car parks, grass access roads and event and festival parking areas. The 13mm thick Medium grade GrassProtecta is ideal for overflow car parking, lawn parking and pedestrian paths. The thinner GrassProtecta Lite is 10mm thick and is ideal for more occasional grass parking, grass paths and wheelchair access routes. 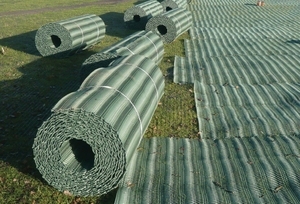 Grass Reinforcement Mesh is manufactured in the UK by TERRAM, and supplied in 1m and 2m wide rolls. The plastic mesh has a wavy design, manufactured this way to prevent newly laid areas being slippy. The plastic mesh has been developed with a rough surface to compliment its anti-slip properties.